George Clooney plays the Dark Knight, facing his deadliest threat yet: cold-hearted Mr. Freeze (Arnold Schwarzenegger) and venemous Poison Ivy (Uma Thurman). Batman has more than Gotham City to protect: the youthful eagerness of crimefighting comrades Robin (Chris O'Donnell) and Batgirl (Alicia Silverstone) puts them frequently in harm's way. New very special effecst include a wild sky-surfing sequence and Mr. Freeze's outrageous arsenal of ice-blasting weapons. 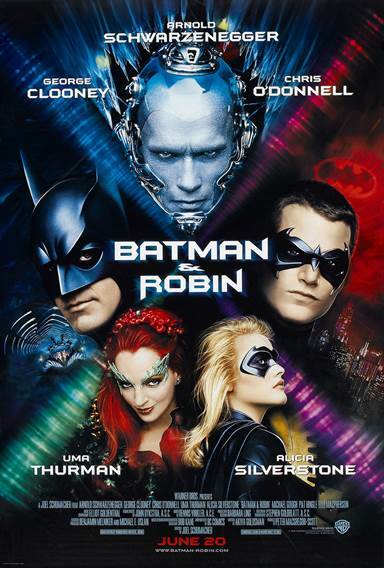 Download Batman and Robin in Digital HD from the iTunes store. Batman and Robin images are © Warner Bros.. All Rights Reserved.